"[Lynne] made a solo single just for fun (a disco spoof called Doin' That Crazy Thing)." "[Doin' That Crazy Thing] was just a bit of fun. I played everything and I had a great time doing that. I'm the best disco drummer you've ever seen, steady as a rock. What happened was that I was in Hawaii with David Arden, our manager, and we were in this disco, dancin' and boozin' and I thought, 'I'm going to nick one of these records because that's one of the best drum beats I've heard.' Then I went home and wrote this silly little tune." "Soon after this the release of With A Little Help From My Friends/Nowhere Man], Jeff released Doin' That Crazy Thing, b/w Goin' Down To Rio. They are both disco-orientated songs, the A-side in particular sounding very like the Bee Gees, whilst the 8-side had a Latin influence later picked up on on Across The Border and The Way Life's Meant To Be. In America, even the added attractions(?) of a 12-inch picture sleeve detailing an accompanying dance routine could not persuade the record to chart." "...Jeff... started to record Doin' That Crazy Thing / Goin' Down To Rio. Both songs were pure Disco in the dreadful sound people loved to listen to in those days. Jeff had listened to that kind of sound in a disco and wondered if he could do it as good-- or as bad!-- as they did it. He played all the instruments on this record and had a good laugh, when the record totally flopped." 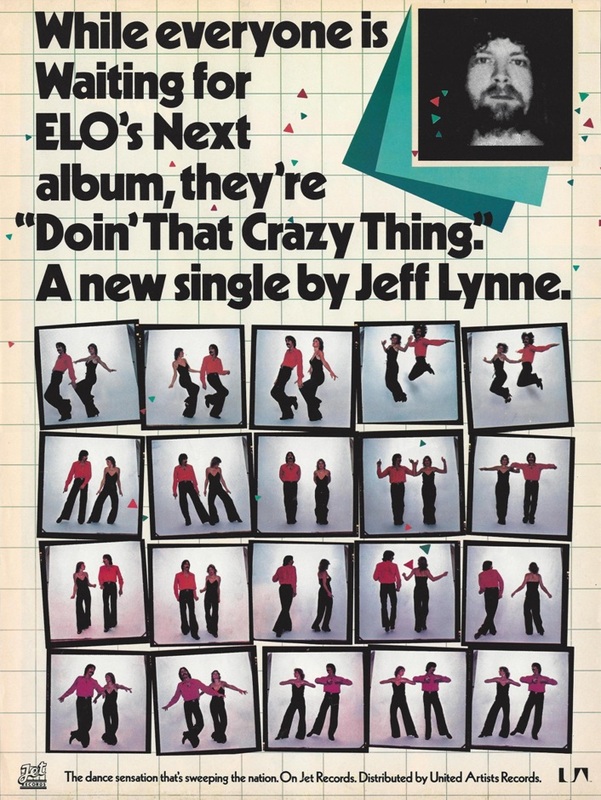 "The string [of ELO hits] gave ELO plenty of time to work on... various solo projects, most notably Lynne's maiden voyage, the vastly underrated and nearly-forgotten Doin' That Crazy Thing." "A solo single by Jeff Lynne, Doin' That Crazy Thing, received very little airplay and sank without a trace." "In the summer of 1977 Jeff wrote, recorded, and released his own contribution to the disco market, the single Doin’ That Crazy Thing. Despite the group’s high profile at that time, the public were evidently not ready to accept Jeff as a solo performer as well, for the record received little airplay and did not chart. But as far as the group were concerned, things could hardly have been better—and there would be more new world records to follow."